While I was in Belgium last week, I went to an exhibit at the Strombeek gallery in Brussels that highlighted work by Johan Grimonprez (director of Double Take). One of the pieces was a sound piece, an interview with Karen Black. One doesn't listen to the interview with headphones but in a small, round room with a platform in the middle. 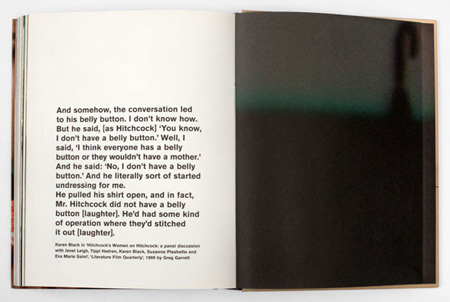 The room is dimly lit, with a paraphrase of a line from the interview (about Alfred Hitchcock not having a belly button) written in white on one of the dark blue walls. One can sit or lie down on the platform—I bet 4-5 people could lie on it without crowding each other. Most of the interview involves Karen Black's recollecting working with Hitchcock on Family Plot. The piece feels intimate, maybe too intimate (I wonder if it feels the same to people who have never seen Karen Black). It feels more intimate than it would if one were reading it or even than it would if one saw the interview on television. The dark space, the enveloping sound, the vulnerability of lying down in a public space all amplify the intimacy, the intrusion. One gets absorbed in or enveloped by her voice, caught up in it, at risk of giving over to it. Her voice feels more intimate than it would if one were listening to it with headphones or earbuds or on a laptop in an office—with all those versions of personal media we are less exposed in our hearing, less vulnerable to others' seeing us and maybe hearing us hearing (hearing us hearing could be linked to a version of a primal scene or to hearing ourselves being heard). She does impressions—of Hitchcock, of different accents. These seem risky, outrageous—why is she performing so much, why is she so over the top—but even quick attempts to dismiss them—well, she is an actress, after all—can't bracket the excess and intensity of her enveloping voice. It's her voice, in all those impression; her voice, pretending to be Hitchcock. And how is it, then, that with vocal doubles we experience two people but one voice? The pleasure is the imitation, the impersonation, the slight exaggeration and bringing to our attention the eccentricity or uniqueness of what now echoes as an original. But the uniqueness only resounds as 're', as a repetition, as the approach to the original that isn't. With the vocal double, we hear the one who is speaking and know that it is him, but we also hear another—only rarely do we mistake one for the other, we know the difference (and that knowledge is a component of the very possibility of impersonation, of a vocal double—we could compare the vocal double, then, with the voice-over or the voice of an animated character). I don't like hearing my voice. I don't listen to interviews or podcasts that I've done. I loathe listening to answering machines or voice mail when I have to hear my voice (although I should confess that this sometimes reverses itself as I listen over and over again to my greeting, somewhat repulsed, but still unable to stop listening and re-recording, perhaps in an attempt to eliminate the excessive part, the part that I can't quite control—and, no, it's not just the southern accent, although it could be related to the oddness I hear in the attempts to displace it). Even doubled or impersonated, the voice is Real. Even recorded voices, taped voices, are Real—we can tell the difference. On the phone, we can hear if something is wrong--sometimes it's easier to hear that something is wrong than to see it—appearances can be deceiving. I don't like talking on the phone very much, either, wary of the exposure that is more intense than a face to face encounter, likely because face to face we see the reactions of the other. Surrounded by music and noise, do we lose voice(s)? Or are we protecting ourselves from their intensity? Are we, vulnerable bare lives, barely subjects, whatever beings, at the mercy of the imaginary and the Real and denuded of Symbolic protections, do we need the noise to avoid the voice (and might schizoanalysis fail insofar as it risks trivializing the intrusion of voices without bodies)? And how has contemporary pseudo-politics worked to block from us the radicality of the Real voice, inducing us to refer to any misrepresentation or exclusion as a loss of voice or a denial of voice when really adding to the cacophony is the surest way for the voice not to be heard? Can there be a Real voice of the people?